Last year at Vinitaly, Franciacorta’s official sommelier Nicola Bonera (one of the top wine professionals working in Italy today) conducted an experiment: He took a number of bottles of Franciacorta that had been opened for a tasting and he left them opened (no stopper or seal) in the cooler at the Franciacorta Consortium stand. On the last day of the fair, he tasted me and a number of other fair-goers on the wines. He was not surprised that I was blown away by how fresh and vibrant the wines were — even after being open for at least 3 days. By happenstance, I conducted a similar experiment the other day at our house in Houston. I had poured a nice flight of Franciacorta at the Italy-Texas Chamber of Commerce Tasting on Wednesday of last week. On Thursday, I opened a spare bottle from the tasting: A non-vintage rosé. I don’t know the date of disgorgement but I believe the wine had been release more than a year ago and so it wasn’t a “current release” bottling (and yes, it’s one of the perks of my gig with the Franciacorta Consortium!). After Tracie P (my wife) and I enjoyed a glass of the wine on Thursday night, I put it back in the fridge but forgot to put a stopper in it. 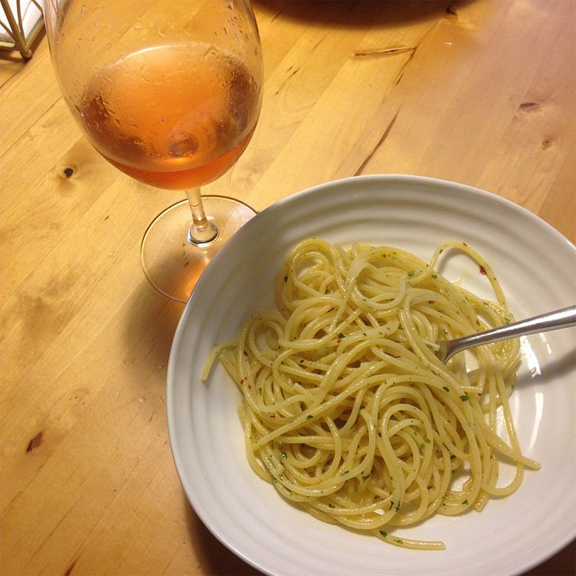 On Saturday night, with our daughters sleeping soundly and Tracie P out for a “girls night” out with her sister, niece, aunt, and mom, I made myself one of my favorite “bachelor” dishes: Spaghetti Aglio Olio Peperoncino. And I poked around in fridge to find something to drink. When I poured a taste of the Franciacorta, it was so fresh and vibrant that even a jaded wine professional would have mistaken it for a freshly opened bottle. It was remarkable, really. I have my own theories as to the reasons behind Franciacorta’s remarkable and long-lived freshness. And I plan to grill Nicola and other Franciacorta experts on their insights. I’ll share them here on the blog. In the meantime, one thing is certain: Franciacorta has a natural ability to avoid unwanted oxidation. Acidity and tannic structure definitely play a role. But what is it about Franciacorta that gives it this unique capacity for freshness? I’ll find out… stay tuned!